Killing Lasantha And Attacking Journos: Was It Gota Or Fonny Or Both? Torture survivor journalist Keith Noyahr informed the Sri Lankan government via Interpol that he would not participate in the ongoing investigations until they arrest the persons who gave the orders for his abduction out of fear for his life, Colombo Telegraph reliably learns. The Keith Noyahr abduction in 2008 took a decisive turn when the journalist made a written complaint to the Criminal Investigation Department a few months ago. Noyahr fled the country with his family to Australia no sooner he was released from hospital without making a detailed statement of his abduction and assault. The CID who were thick into the investigations into the murder of Senior Journalist Lasantha Wickremetunge, assault of Editor Upali Tennakoon were poised to make a breakthrough after much painstaking leg work. They had unraveled the hitherto mystery and found a link between seemingly unconnected events between the three separate incidents. The Criminal Investigations sleuths needed a detailed statement from Noyahr to tie up the loose ends. Noyahr finally made a statement and the CID pieced together the loose ends. All of the above mentioned crimes were handled by one group. The CID informed the Mt Lavinia Magistrate of their findings in open court when the Lasantha Wickremetunge case came up for hearing last week. Prior to the last hearing the CID had reported to Court of the progress that was being made into each of the cases and the links between them. The telephone records that were unavailable turned up after the change of government, supported by new equipment which enabled the investigators to go far beyond the three month records the telecom provider had hitherto maintained. The Mt Lavinia Magistrate had ordered an identification parade in to the Noyahr assault and the victim was requested to present himself in the country for such purpose. The CID had informed Keith Noyahr to present himself at such parade in person via Interpol. Colombo Telegraph understands through reliable Interpol sources that Keith Noyahr has made a startling revelation as to why he is unable to present himself in the island before an identification parade. Noyahr has stated via Interpol that he did not know any of the military persons who are in remand for his abduction and assault nor had any dealings with them. He further states that these officers obviously were used or ordered to carry out an attack on him by others who had authority over them. Therefore since these people in authority are yet running loose, he fears for his life to be present at an identification parade at this juncture. “It is perfectly understandable that Noyahr is apprehensive to say the least when one peers back into the dark period when journalists were harassed, assaulted, abducted and murdered. Those in command positions in the Army and even above them have been named and shamed for being behind the dastardly attacks on journalists. 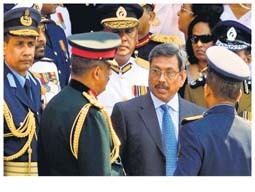 Noyahrs predicament should be understood in this backdrop.” the CID sources told Colombo Telegraph. Field Marshal Sarath Fonseka too was questioned by the CID in connection with the murder of Lasantha Wickremetunge. The Field Marshal’s name too was linked time and again as being a possible suspect even by the high and mighty. Fonseka even after eight years, made a statement laying the blame at the doorstep of Gotabaya Rajapaksa and Gen. Kapila Hendavitharna, the “Army Intelligence Chief”. Gotabaya in turn makes public statements accusing Field Marshal of being behind the murder of Lasantha. “One thing becomes clear. It’s the Army Intelligence that was behind the attacks and murders of journalists. It also appears that it was Gotabaya or Fonseka according to their own statements. OR WERE THEY IN ON IT TOGETHER at the time?” a highly placed intelligence source told Colombo Telegraph.